But he also said: “This conduct is in no way reflective of the man I have become in the nearly 40 years since. Herring, who plans to run for governor in 2021, is among those who have urged Northam to resign after the discovery of a photo on Northam’s yearbook profile page of someone in blackface standing next to a person in a Ku Klux Klan hood and robe. Last Friday, Herring condemned that photo as “indefensible” and said it is “no longer possible” for Northam to lead the state. Herring spent most of his life in Northern Virginia’s Loudoun County, where he practiced law after earning bachelor’s and master’s degrees from the University of Virginia and his law degree from the University of Richmond. In 2006, as a state senator, he supported a Virginia constitutional amendment that outlawed gay marriage. 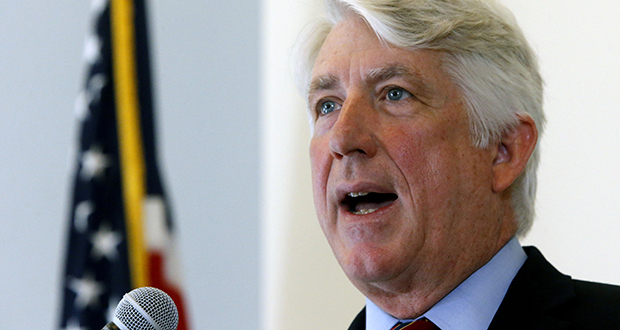 But as term as attorney general, Herring made national headlines for his efforts to overturn Virginia’s ban on gay marriage. Shortly after taking office, Herring said he would no longer defend the state in a federal lawsuit that challenged the state’s ban on gay marriage as unconstitutional. “It’s time for the commonwealth to be on the right side of history and the right side of the law,” he said at the time. A federal judge overturned the state’s gay-marriage ban, and cited Herring’s opposition to the ban as a “compelling” factor in her decision. Virginia court clerks began issuing marriage licenses to gay couples in October 2014, nearly a full year before the U.S. Supreme Court issued its ruling allowing gay marriage nationwide.